Originally [Rory] was working on a 3D printed design, but quickly ran into problems. 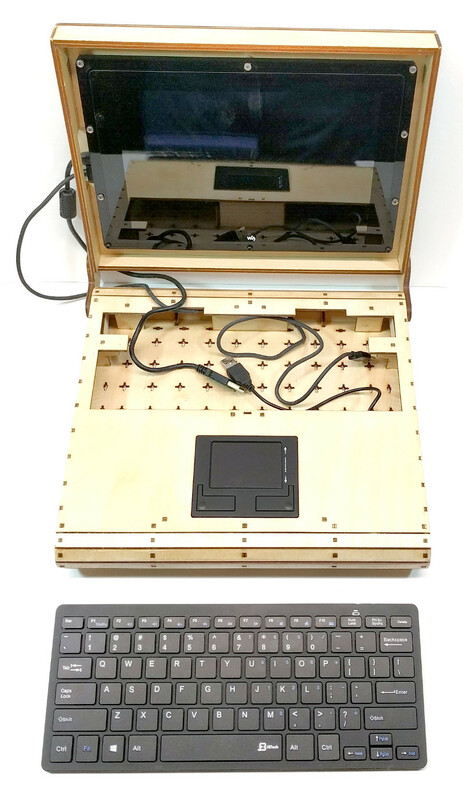 The vast majority of 3D printers don’t have nearly the build volume to print out a laptop case in one shot, so the design needed to be broken up into multiple smaller pieces and then grafted together into the final case. Not only did this take a long time and a lot of material, but the final result had the rather unfortunate appearance of a plastic quilt. Eventually he got hooked up with a maker collective in Minneapolis that had a laser cutter, and the PlyTop was born. There’s still a 3D printed component in the design that goes in the screen hinge, but the rest of the PlyTop is cut out of a three 2′ x 4′ sheets of 1/8″ Baltic birch plywood. As you might expect, plenty of fasteners are required, but [Rory] has a complete Bill of Materials (complete with purchase links) for everything you’ll need to turn the cut pieces into a fully fledged laptop. He’s considering selling kits in the future, but is still working on the logistics. In keeping with the idea of complete flexibility, there’s no defined layout for the internals of the PlyTop. Rather, there’s an array of star-shaped openings on the bottom plate that allow the builder to connect hardware components up in whatever way works for them. [Rory] actually suggests just holding everything down with zip ties to allow for ease of tinkering. He’s also come up with a list of suggested hardware for the keyboard, touchpad, and display; but those are really just suggestions. The design is open enough that it shouldn’t take much work to adapt to whatever gear you’ve got laying around. Of course, this isn’t the first open source laptop we’ve seen here at Hackaday. It isn’t even the first wooden one. But we love the lines of the PlyTop and the focus on complete customization. Get Together and Hack this Saturday at World Create Day! Spend some time with the Hackaday Community in your area this weekend. There are more than 100 community organized meetups happening this Saturday for Hackaday World Create Day. Check the big map for one near you and click the “Join this event” button in the upper right of their events page to let them know you’re coming. Sticker packs we’ve been sending out to local event organizers. It’s always a blast to get together with friends new and old to work on a project you’ve been itching to build. Grab something from your work bench and have fun geeking out about it in the company of others. This is a great opportunity to get started on your 2018 Hackaday Prize entry. Brainstorm ideas for a project, get advice on your early build plans, and consider forming a team. Submit what you come up with this Saturday as your entry and improve upon it over the coming weeks. Can you still sign up to host World Create Day? Of course! Fill out this form and we’ll get you set up right away. If you simply can’t make it to a live event, you can still take part. Set aside time to hack and show off the stuff you’re working on through social media. We have a Tweetwall set up (great to put up on the projector during group meetups) which shares Tweets with the hashtag #WorldCreateDay. We’re on the lookout for cool stories and interesting hacks from your meetup so that we can feature them here on Hackaday. Last year we featured a number of meetups, like automated gardening in Cyprus and etching Robot PCBs in Osaka. There was also a roundup with baby guitar amps, power racing series, and Wacky Waving costume assembly. It’s truly a worldwide thing, here’s a roundup that spanned India, Austrailia, and the USA. Take pictures, write about what goes one, and tag everything #WorldCreateDay so we have the info to report on your meetup!